Richard Pierce is a Vietnam Marine Military Veteran. 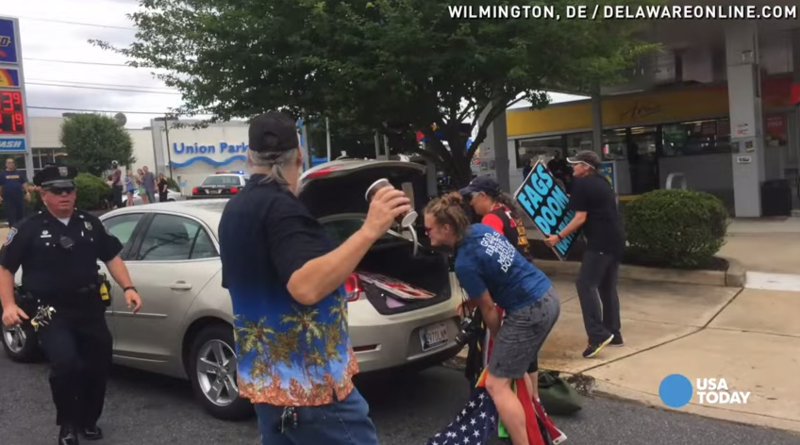 Richard confronted the Westboro Baptist Church while they were protesting Biden’s funeral. When they started draggin an American flag on the ground Richard threw his coffee at them. Richard was at the funeral because he wanted to counter protest the Westboro Baptist Church. Richard said that even though he was no fan of Biden, he still wanted to support them and wanted to prevent the WBC from disrupting the funeral. 3 Comments on "Richard Pierce – Wilmington Delaware – Hero"
GOD BLESS HIM AS WELL,ALL HARD WORKING,TAX PAYING,GOD FEARING AMERICANS NEED TO COME TOGHTER NOW,WE ALL MUST STAND OUR GROUND NEAR AND A FAR TO BATTLE ALL WHO ARE AGAINST ANYTHING GOOD,OF WHAT IS LEFT.SO THERE WILL BE SOMETHING FOR ALL FUTURE GENERATIONS OF AMERICA!